After a power plant's alert system failed causing Wednesday's dramatic drop in the Boise River flow, Idaho Fish and Game biologists are concerned about potential impacts to wildlife. The river went from flowing at 290 cubic feet per second (cfs) to 81 cfs in a matter of hours. Barber Dam's power was restored early Wednesday morning, constricting the flow of water for nearly eight hours. 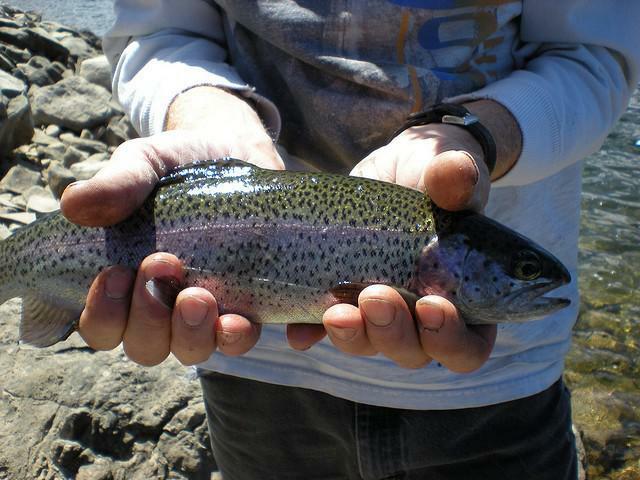 Idaho Fish and Game says the young rainbow trout population could have been impacted by this week's unexpected low flow in the Boise River. Idaho Fish and Game biologist Joe Kozfkay says he and his team checked the river from Barber Dam to the Broadway Bridge, and didn't find any evidence of dead adult fish. But he says the winter is a critical time for young rainbow and brown trout that live in shallow areas, and he says it's hard to imagine some weren't killed when the low flows continued for hours. “Brown trout spawned last fall in November," says Kozfkay, "and their eggs and hatchlings would still be in or around the gravel and they could have been stranded or left high and dry by rapid decreases of that magnitude." The biologist says they'll look closer at shallow spots along the impacted stretch of the Boise River in the next few weeks to figure out how many young fish could have died. Depending on what they find out, Idaho Fish and Game could seek money from Enel Green Power, the company that owns Barber Dam. Kozfkay says in a situation like this, the department would try and work with the company to improve habitat along the Boise River. The department is also concerned about insect hatching that could have been affected, and how that could trickle down the ecosystem. You might have noticed the Boise River was lower than normal Wednesday morning. At midnight, the gauge at Boise's Glenwood Bridge showed the river was flowing at 290 cubic feet per second (cfs). At 10:45 a.m., the river had dropped to just 81 cfs. Ryan Hedrick is a hydrologist at the Bureau of Reclamation, the agency that controls the flow of water to the river at Lucky Peak. He says the significant drop this morning was due to a problem at a Boise hydroelectric plant in the middle of the night. Flow in the Boise River set a record low this week. According to the U.S. Geological Survey, flow Thursday at the Glenwood bridge on Boise’s west side was the lowest ever recorded on May 8.